San Diego County Crime Stoppers and investigators from the San Diego Police Department’s Homicide Unit are asking for the public’s help in identifying and locating the suspect(s) responsible for the murder of 22-year-old Gregory Ruffin Jr.
On February 24, 2019, at approximately 11:11 p.m., San Diego Police Officers along with San Diego Fire-Rescue personnel responded to a report of a person down in the 300 block of 47th Street in San Diego. Officers found 22-year-old Gregory Ruffin Jr. lying on the sidewalk and was suffering from apparent trauma to his upper body. Life-saving measures were attempted, but were unsuccessful. Ruffin Jr. was pronounced deceased at the scene. San Diego Police Homicide Detectives were called to the scene and began investigating the incident. Detectives are trying to determine the circumstances which led to the victim’s death. Anyone with information on this murder is asked to call the San Diego Police Department’s Homicide Unit at (619) 531-2293 or the Crime Stoppers anonymous tip line at (888) 580-8477. Crime Stoppers is offering a $1,000 reward to anyone with information that leads to an arrest in this case. Visit the Crime Stoppers website at www.sdcrimestoppers.org for more information on how to send anonymous web and mobile app tips. San Diego County Crime Stoppers continues to work with investigators from the National City Police Department’s Homicide Unit and are asking for the public’s help in identifying and locating the suspects who murdered 16-year-old Romel Velarde 12 years ago. On January 19, 2007, at about 6:30 p.m., Romel Velarde was shot and killed in front of his home in the 2300 block of E. Division Street, in National City. Two unidentified males were seen running from the area. A brown colored van or SUV was seen driving away immediately after the shooting. Anyone with information about this murder is asked to call the National City Police Department’s Homicide Unit at (619) 336-4472 or the Crime Stoppers anonymous tip line at (888) 580-8477. Crime Stoppers is offering a $1,000 reward to anyone with information that leads to an arrest in this case. Visit the Crime Stoppers website at www.sdcrimestoppers.org for more information on how to send anonymous web and mobile app tips. Media inquiries about this case can be directed to Lt. Greg Seward at (619) 336-4538 or email at Gseward@nationalcityca.gov . San Diego County Crime Stoppers and investigators from the National City Police Department’s Crimes of Violence Unit are asking for the public’s help in identifying and locating the suspect(s) responsible for the murder of 55-year-old Lowry Richard “Ricky” Rivers. On April 8, 2018, at approximately 4:52 a.m., National City Police Department Officers responded to the 100 block of North Highland Avenue regarding a report of gunshots heard in the area. Officers arrived on scene and found Lowry Richard “Ricky” Rivers suffering from a gunshot wound. Paramedics arrived on scene and transported Rivers to a local hospital where he was pronounced deceased. Anyone with information about this murder is asked to call the National City Police Department at (619) 336-4467 or the Crime Stoppers anonymous tip line at (888) 580-8477. Crime Stoppers is offering a $1,000 reward to anyone with information that leads to an arrest in this case. Visit the Crime Stoppers website at www.sdcrimestoppers.org for more information on how to send anonymous web and mobile app tips. Media inquiries about this case should be directed to Sgt. Christopher Sullivan at (619) 336-4423 or email at csullivan@nationalcityca.gov . San Diego County Crime Stoppers, along with investigators from the San Diego Police Department’s Homicide Unit, are asking for the public’s help in finding out what happened to Baby Doe. On May 4, 2004 two hikers found skeletal remains on a hiking trail in Rancho Bernardo. Forensic testing indicates the remains are that of a 2 to 4-year-old boy probably born sometime between 1999 and 2001. Baby Doe’s features are consistent with being mostly Caucasian and is believed to have had light to medium brown hair. Additionally, isotopic testing indicates it is likely that Baby Doe was born on the mainland United States. During a portion of her pregnancy, Baby Doe’s mother likely resided in the Southeastern region of the United States where Baby Doe may have spent his first year of life before migrating westward toward California. The image above of Baby Doe was developed by a forensic artist with the National Center for Missing and Exploited Children. The clothing items featured were found with Baby Doe. Anyone with information on what happened to Baby Doe is asked to call the SDPD Homicide Unit at (619) 531-2293 or the Crime Stoppers anonymous tip line at (888) 580-8477. Visit the Crime Stoppers website at www.sdcrimestoppers.org for more information on how to send anonymous web and mobile app tips. Detectives are asking for information that helps identify Baby Doe and/or his biological parents and information that also helps detectives figure out what happened to Baby Doe. A reward of up to $1,000 is being offered if information provided leads to a felony arrest. 5’1” tall and weighs about 148 lbs. Janice Macedonio is wanted by the San Diego Fugitive Task Force for a no bail felony warrant for homicide. 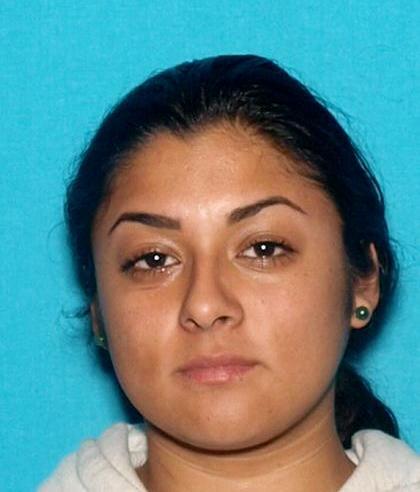 She is wanted in the March 1, 2014 murder of Ruben Bodden, who was found dead inside his transmission repair shop on North Santa Fe Avenue in Vista. Janice was last seen in the company of her daughter who is now 7-8 years old. Janice Macedonio has “Brooklyn” tattooed on her upper right chest. She is known to frequent Vista, but detectives suspect she’s hiding out in Mexico. 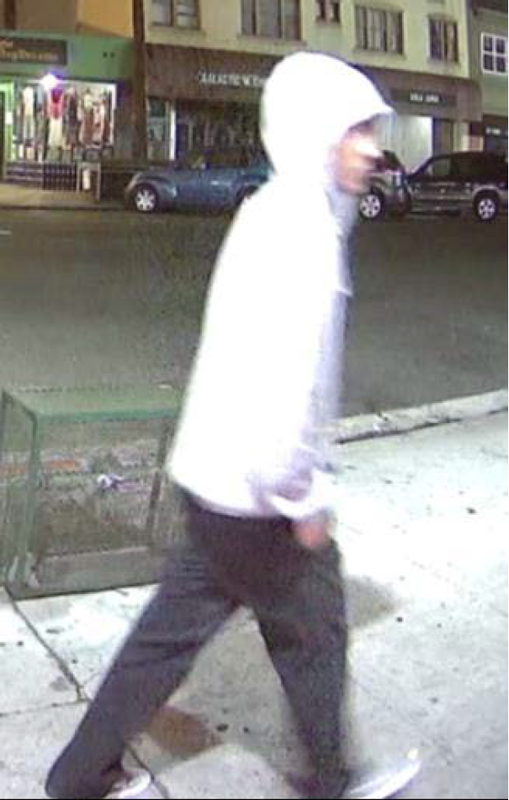 San Diego County Crime Stoppers and investigators from the San Diego Police Department’s Homicide Unit are asking for the public’s help in identifying and locating a suspect involved in the murder of a business owner in the East Village area. On October 10, 2018, at approximately 3:42 p.m., the San Diego Police Communications Center received a 9-1-1 call from a customer who had entered a business in the 1000 block of G Street and found what he believed to be a deceased male. Patrol officers and San Diego Fire-Rescue personnel arrived approximately two minutes later. When the officers entered the business, they found 49-year-old Ghedeer Tony Radda down inside who had no pulse, was not breathing and had apparent trauma to his upper body. CPR was initiated, but unfortunately Radda succumbed to his injuries and was pronounced deceased at 4:04 p.m.
San Diego Police Homicide Detectives were called to the scene and are investigating the incident. Based on information developed during their investigation, 51 year-old Kevin Eugene Cartwright was identified as the male suspect. Cartwright was arrested in the City of El Cajon on October 17th and was booked into jail for the murder. Cartwright was accompanied by a female suspect during the incident. She is described as a light skinned female wearing a purple wig. She was wearing a dark jacket and blue jeans. Investigators are still trying to identify the female suspect. Anyone with information on the identity and or location of this female suspect is asked to call the San Diego Police Department’s Homicide Unit at (619) 531-2293 or the Crime Stoppers anonymous tip line at (888) 580-8477. Crime Stoppers is offering up to a $1,000 reward to anyone with information that leads to an arrest in this case. Visit the Crime Stoppers website at www.sdcrimestoppers.org for more information on how to send anonymous web and mobile app tips. Media inquiries about this case should be directed to Lt. Matt Dobbs at (619) 531-2425 or email at mdobbs@pd.sandiego.gov. San Diego County Crime Stoppers and investigators from the San Diego Police Department’s Homicide Unit are asking for the public’s help in identifying and locating the suspect responsible for the murder of 65-year-old Steven Barnes. On July 21, 2018, at 2:04 a.m., officers with the San Diego Police Department responded to a report of an injured person in the 4500 block of Pacific Highway, in the Old Town area of San Diego. Officers located Steven Barnes lying on a sidewalk at that location. Barnes had sustained lacerations and trauma to his upper torso. San Diego Fire Department Paramedics responded to the scene and rendered first aid to Barnes. Despite their efforts, Barnes was pronounced deceased at the scene. Detectives from the San Diego Police Department’s Homicide Unit responded to the scene. Detectives were able to get suspect information during the course of their investigation. The suspect is described as a light skinned male, possible Hispanic and Black or White and Black, 18 to 25-years-old, thin build, approximately 5’8” to 5’10” tall, goatee, and shoulder length dark colored hair. The suspect was last seen wearing tan Dickie style shorts with red stripes, light colored shirt, black backpack with white stripes, and was seen riding a yellow “OFO” bicycle. Media inquiries about Crime Stoppers should be directed to Officer Mark Herring at (619) 531-1500 or email at msherring@pd.sandiego.gov or Deputy Adriana Uribe at (619) 531-1547 or email at adriana.uribe@sdsheriff.org. San Diego County Crime Stoppers, along with investigators from the San Diego Police Department’s Homicide Unit, are asking for the public’s help in locating Dominique Grady who is wanted in connection with the murder of 21-year-old Jossie M. Ruiz. On June 16, 2018, at 5:11 p.m., the San Diego Police Department’s Communications Center received a 911 call from a resident in the 3600 block of 45th Street regarding a possible death. The first patrol officers arrived and discovered Ruiz deceased in her apartment from a gunshot wound. Homicide investigators were called to the scene and investigated the death. Investigators have identified Dominique Grady as the suspect in this case and a warrant has been issued for his arrest. Dominique Grady is described as a Black male, 26-years-old, 5’6” tall, and weighs 140 lbs. Anyone with information on the location of Dominique Grady is asked to call SDPD at (619) 531-2000 or the Crime Stoppers anonymous tip line at (888) 580-8477. Visit the Crime Stoppers website at www.sdcrimestoppers.org for more information on how to send anonymous web and mobile app tips. San Diego County Crime Stoppers and investigators from the San Diego Police Department’s Homicide Unit are asking for the public’s help in identifying and locating the suspect(s) responsible for the murder of 20-year-old Darnell Smith. 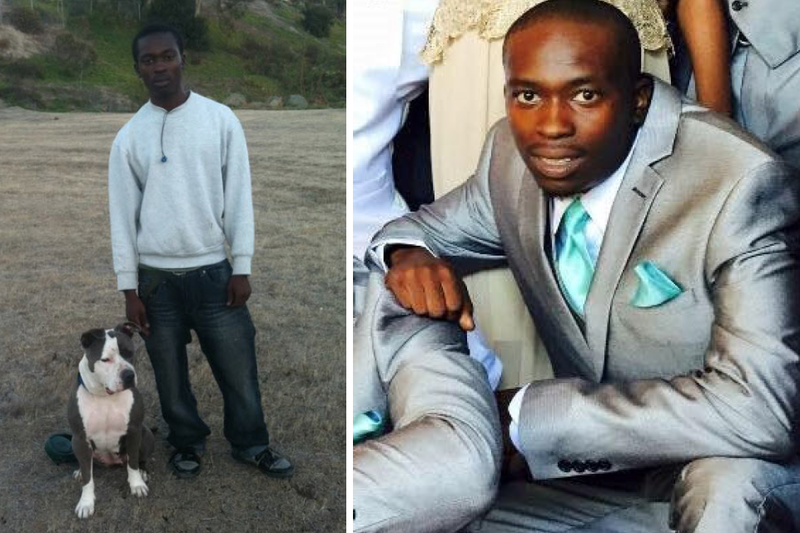 On June 15, 2008, at approximately 12:20 a.m., Darnell Smith parked his car in the 700 block of Pyramid Street, located in the Emerald Hills area of San Diego. Smith was with several relatives and was walking to his aunt’s house from his car. An unknown suspect stepped out of a vehicle, walked up behind Smith and his relatives, and fired multiple rounds at the group. Smith was struck and died at the scene. Witnesses described the suspect’s vehicle as a newer black Ford Escape or a similar vehicle with tinted windows. Smith was an employee of Cox Communications and a student at San Diego Mesa College working towards a business administration degree. Cox Communications is offering $2,500 in addition to Crime Stoppers’ $1,000 reward to anyone with information that leads to an arrest in this case. San Diego County Crime Stoppers and investigators from the Oceanside Police Department’s Crimes of Violence Unit are asking for the public’s help in finding the person(s) responsible for murdering 25-year-old Erik Ramsey. On April 10, 2018, at approximately 5:00 a.m., police officers from the Oceanside Police Department responded to a report of a subject down in the 1300 block of Dubuque St. in Oceanside. Officers found the victim, identified as Erik Ramsey of Oceanside, lying on the sidewalk in front of 1302 Dubuque St. Through the investigation, it was discovered that Ramsey had been murdered and was pronounced deceased at the scene. Anyone with information on the identity or location of the person(s) responsible for this murder or any suspect vehicle information is asked to call the Oceanside Police Department at (760) 435-4748 or the Crime Stoppers anonymous tip line at (888) 580-8477. Crime Stoppers is offering a $1,000 reward to anyone with information that leads to an arrest in this case. Visit the Crime Stoppers website at www.sdcrimestoppers.org for more information on how to send anonymous web and mobile app tips. 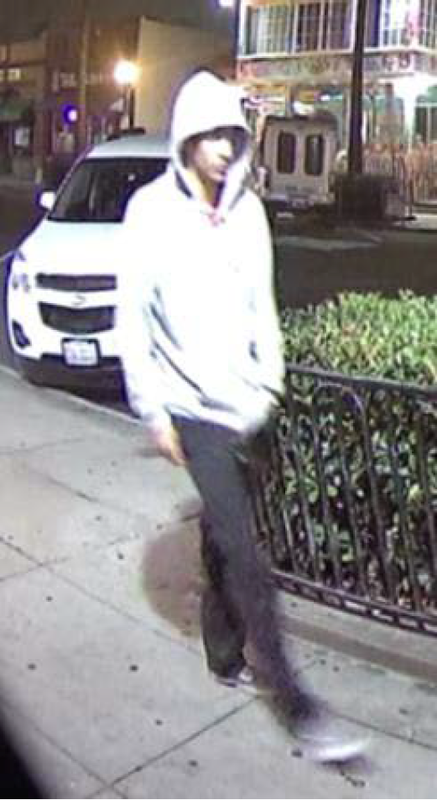 San Diego County Crime Stoppers and investigators from the San Diego Police Department’s Western Division are asking for the public’s help in identifying and locating an unknown suspect who stabbed a victim multiple times in the Hillcrest area of San Diego. On April 8, 2018, at 7:18 p.m., San Diego Police Officers responded to a radio call of a stabbing at the intersection of Richmond Street and University Avenue, in San Diego. Officers found a 51-year-old male lying on the sidewalk who was suffering from multiple stab wounds to his head and neck area. The victim was transported to a local hospital with life threatening injuries. The victim remains hospitalized but is expected to survive. Investigators learned that the suspect was walking in the area approximately thirty minutes before the attack and appeared to be looking to fight a random person. The suspect originally threw a rock towards the victim and left the area. The suspect later saw the victim walking and began stabbing the victim multiple times in the head and neck. The suspect fled the area before police arrived. The suspect is described as a Hispanic male, 25 to 35-years-old, 5’6” to 5’8” tall, thin build, wearing a dark colored baseball hat, dark gray sweatshirt, and gray sweatpants. Anyone with information on the identity or location of the suspect is asked to call San Diego Police Department’s Western Division at (619) 692-4820 or the Crime Stoppers anonymous tip line at (888) 580-8477. Please visit www.sdcrimestoppers.org for information on how to send a web or mobile app tip. Crime Stoppers is offering up to a $1,000 reward to anyone with information that leads to an arrest in this case. Tipsters can remain anonymous. Photos of the suspect can be found in the release. Contact information can also be found in the release. San Diego County Crime Stoppers and investigators from the San Diego Police Department’s Homicide Unit are asking for the public’s help in locating Ernesto Castellanos Martinez who is wanted for the murder of 27-year-old Alexander Mazin..
On February 25, 2018, at 10:49 a.m., San Diego Police Officers responded to the rear parking lot of 3675 Midway Drive to investigate a report of a shooting. When officers arrived, they found Alexander Mazin suffering from gunshot wounds. Despite officers rendering medical aid to Mazin, he was pronounced deceased at the scene. San Diego Police Department Homicide Detectives determined that 41-year-old Ernesto Castellanos Martinez shot Mazin and then fled the area before police arrived. Anyone with information about the location of Ernesto Castellanos Martinez is asked to call the San Diego Police Department’s Homicide Unit at (619) 531-2293 or the Crime Stoppers anonymous tip line at (888) 580-8477. Crime Stoppers is offering a $1,000 reward in addition to an $8,000 reward being offered by friends and family of the victim to anyone with information that leads to an arrest in this case. Visit the Crime Stoppers website at www.sdcrimestoppers.org for more information on how to send anonymous web and mobile app tips.